You don't see much of Rocket these days. The most you'll see of her is a cameo in Young Justice where she barely speaks. Despite that, she truly is one of the most important characters in comics history even if you don't believe it. Even if it isn't often brought up, she has an extensive history of firsts and setting trends that would follow for decades. If you don't know Rocket she's often seen as just the sidekick of Icon. The thing is, he's more like her sidekick. See, he was content with never being a hero and just living a quiet life. She's the one who pushed him to be a hero. She's the one that made him see the importance of people and keeps their relationships together. People often forget that because he's the more powerful of the duo, but between them, she's certainly the leader. Her favorite thing to do is write because Toni Morrison is her hero. I'll admit I'm not the biggest Marvel Comics fan but I've always had a soft spot for Jessica Drew, especially her Ultimate Universe version. I started thinking about how Rocket was important when Jessica Drew got pregnant. Suddenly there were all these articles, news stories, think pieces and so on about how great it was that comics finally acknowledged pregnancy exists. Now, I thought that was silly because we've seen Stephanie Brown, Jean Gray and others be pregnant before. It wasn't just strange that she was being called the first. She was also being praised for being depicted as a single mother. But here's the thing, she wasn't first. All the way back in 1993, Raquel Evans better known as Rocket became pregnant. A black teenager, in the pages of a comic book became pregnant and touched on many issues other media wouldn't touch at the time. Not teen pregnancy, not the idea of abortions, not being a single mother. Despite that, Rocket still gave birth to the baby. Additionally, she did not place the baby up for adoption or anything like that, which other writers would use to avoid these situations. But here's the big kicker, they didn't write Rocket out of stories either. No, after a short break she returned to be a superhero while still raising her child. When Carol Danvers got pregnant, she left this dimension. When Jessica Drew had her baby, she retired for heroics. Marvel caught Hell from a lot of people for making Jessica Drew a pregnant single mom. Imagine how mad people had to have been in 1993 when Rocket was a single mother. I like Jessica Drew, a lot of people do. A lot of people like Stephanie Brown. The thing is, without Rocket these things would have never happened. 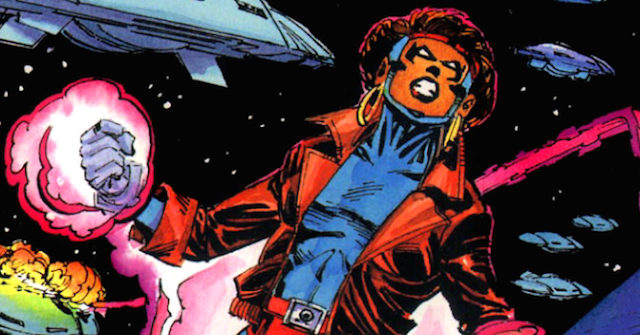 When we talk about black superheroes we often look at firsts, especially in major companies. Black Panther appeared first, Luke Cage had the first Marvel solo, Black Lighting had the first DC Solo. These are things to be proud of. But, since being a single mother often causes people to look down on you, Rocket isn't praised as she should be. Without Rocket blazing the trail, there are some great stories that could not have been told. Even if she doesn't always get praise for, we need to accept what she did. Her popularity was probably knocked down a few rungs because of it, but she was the first and deserves the same praise, if not more, that other characters have gotten.